Life is short when chasing rogue Replicants. Don’t be afraid to use your microwave to speed up cooking. 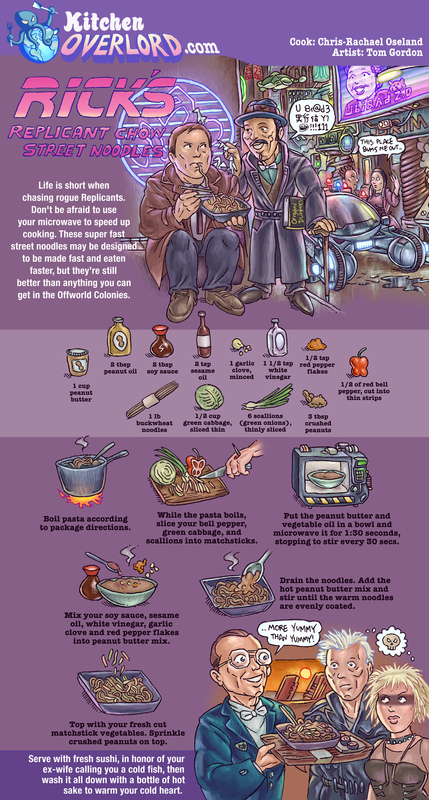 These super fast street noodles may be designed to be made fast and eaten faster, but they’re still better than anything you can get in the Offworld Colonies. While the pasta boils, slice your bell pepper, green cabbage, and scallions into matchsticks. Put the peanut butter and vegetable oil in a bowl and microwave it for 1:30 seconds, stopping to stir every 30 seconds. Mix your soy sauce, sesame oil, white vinegar, garlic clove and red pepper flakes into peanut butter mix. Drain the noodles. Add the hot peanut butter mix and stir until the warm noodles are evenly coated. Top with your fresh cut matchstick vegetables. Serve with fresh sushi, in honor of your ex-wife calling you a cold fish, then wash it all down with a bottle of hot sake to warm your cold heart.